→How much money can you make with a blog? You cannot make money blogging! hhhoooooooooooo! Blogging is simply the activity of creating content and publishing on one or more blogs. This activity in itself cannot earn money. You can be a blogging expert, pulling thousands of visitors to your blog per day but still walking away with not even a cent. That’s simply because blogging does not make money. Period! You can make nothing or thousands of dollars with a single blog. The one foundation you need is targeted traffic. Though traffic alone does not guarantee earnings, it’s the foundation and most required factor. Now let me talk a bit about traffic. This is all about people (1) coming to your blog and (2) spending time and reading your contents. From referral sources: This is traffic from social media, banner ads, blogging communities, comments on other blogs, guest posts, etc You have to be an active blogger in the industry to witness an increase in referral traffic. In addition, you can get direct traffic (people read your blog url on printed papers, business cards, billboards, etc) and traffic from emails (newsletters, email signatures). Be sure to have a good looking blog. Optimize your blog speed for fast loading. Now you have visitors coming to your blog and reading your articles. How does the money come in and how much? I established above that blogging in itself does not generally make the money.What brings in earnings is your monetizing strategy. There are literally many ways to empower your blog to make you money. However, the question here is how much? Your content – If your content is good enough to keep readers, it can affect the amount of money you can make. Monetizing strategies – There are different ways to monetize your blog. Some generate heavier amounts than others. Generally, you will be thinking of Affiliate banners, direct advertising, Adsense, paid posts, selling your own products, etc. Some people have argued that it’s not a possibility to earn 6 figure with a single blog. I think they are completely missing the point. The strategy is to grow your business around one single blog. Most of the top bloggers that earn huge focus on one blog and develop a business around it. I don’t believe in creating many blogs and struggling to maintain them except you are working in a team that makes content creation easier. How many blogs do you have? Do you think you can make enough money with just one blog? Let me hear you out in the comment box below. Thank you for this useful tips, and about one blog vs many, I personally have upto 4 Niche websites and I think this approach is safer as nothing google can do will bring it all down. However, I have authority website that i do no backlink on and it is ranking due to the dosage of contents on it. I’m always so excited to see you on my blog bro. I know you are one of my faithful readers and that explains why. Thanks for hitting up number 1 comment on this post. You know “niche blogs” are easier to maintain than full blown central blogs. You can create as many NB as possible and do well – generating little earnings. However, I think focusing on one blog can make it a big income earner. Even though the possibilities are endless, it depends a lot on the blogger. If one blogger earns $100, another one earns $1000. It depends on determination and the inclination to learn new things. It depends on market knowledge and clever monetization skills. With my second blog (I am sure you’re aware), I have learnt that traffic doesn’t matter much. I mean if I want to earn from AdSense or any other CPC models, a blog needs HUGE traffic but as you know, my second blog targets a niche and so far, the returns are proving to be really good. Anyone who wishes to earn from a blog should decide the monetization strategy before making the blog live…and follow through! Make necessary adjustments as and when necessary but don’t abandon, keep working on it! Now if one blog earns $100 and another $1000, what if you concentrate resources on one? You may end up earning $1500 from it rather than $1100 from two blogs. Don’t forget more than one means more expenditures – domain names, hosting, themes, plugins, etc. Now, you raised very crucial points – the monetizing strategies and niche. I think these should be among the first things to set on table before going on. I am agree with your point that blogging alone can’t generate the Money. Its the marketing Strategies that are applied for the blog create some business around it and then counting the $$$. Truly saying, I am really impressed from you blog. Before this blog, EmFastincome was there on which you were focusing and now this one is rocking more than that blog. I think you have just saved me a whole lot of effort and stress. Good to hear that Wendy! Were you like thinking to create many blogs? BTW, I do respond to every mail that drops in my inbox, especially those from readers and prospects. I get quite many mails to treat daily and surely, I’ll soon be getting to yours. nice post. But still i have not got enough information how to start monetizing my blog. Engage in one kind of business only, and stick to it faithfully until you succeed, or until your experience shows that you should abandon it.Many fortune has slipped through a man’s fingers because he was engaged in too many occupations at a time. There is good sense in the old caution against having too many irons in the fire at once. Thanks for this piece Enstine. To be sincere it is not about the number of blogs, but how effective you establish them. Just a single blog can earn you thousands of dollar depending on the strategies you implement. Creating a blog is one thing, monetizing the blog is another thing. I have seen a blogger who receive over 5,000 visits a day but yet poor. Making money from blogs is not only about getting thousands of visitors but it is about promoting your quality content to well targeted/quality visitors and ensure you have strong monetization in place…then you are on the brick of making thousands of dollar with a single blog. Very correct in this comment bro – traffic alone is not all you need. You need targeted traffic and good monetizing strategies. How are you doing and how is Ghana? Ghana is great, Blogging in Ghana is still new and only few companies recognize bloggers here, it’s a bit hard making money locally as a blogger… so we are left with no choice than to think & act global pending the time we have more bloggers & blogs in Ghana blogosphere….. I only have the chance to chat with my friend Emmanuel of kabenlah.com , working to get more people blogging in Ghana and i believe people like You will stand as a source of inspiration to the wannabe and hope to get you featured on my blog in the nearby future. I have been on your blog. I read the interview with Emmanuel. I bookmarked it and will complete and drop a comment later on today. I like the answer to the question, you can earn thousands of dollars from just one blog but one really must understand that a lot goes into making money online in general. Patience is what matters the most and one can of course make a six figured income from a single blog! Very correct bro – Patience, hard work and smartness will transform your blog into a real money generating machine. Thanks for this post. I currently have one blog which I started in June 2013. I would like the blog to grow very well before I think of having a new one or many others. I am still trying to build more traffic, fans, followers for the blog. Enstine, this is a very good time to discuss an issue like this. There would always be debates and controversies over the number of blogs to have. However, like you rightly said, a lot of factors determine how much one can earn with one’s blog and I don’t need to start mentioning them since you have already listed them in your post. One fact here too is that it is possible to earn 6 figures with a single blog and the likes of John Chow, Pete Cashmore, Darren Rowse, Muhammad Mustafa Ahmedzai, Linda Ikeji, etc. have all proven that to be true. Be that as it may, I want to say that having a great blog that earns in the 6 figures range does not automatically seal up the potential of making more money with diversified sources. More blogs can actually earn you more cash. Now Mashable is no longer run by Pete Cashmore alone; he has hands he has employed to help him. If he establishes a new blog now, he is not going to feel the pang of updating it because he has got the money to employ capable hands to run it and increase his revenue base. A lot of business men who have made it would tell you that the best way of securing your finances is to diversify your sources of income. Though that can also be achieved by adding multiple revenue streams on your blog, I still believe that creating a blog, nurturing it and then adding an extra one is the best way to make more money. Should there be any eventuality, the other blog can sustain you. Efoghor Joseph Ezie recently posted…How does employee engagement and retention correlate? Yeah, we are saying the same thing. I did mention that you can still have multiple streams of income on one blog. I also said that grooming one blog to maturity and then adding another when it is stable would be a great way to ensure financial security. I think the mistake a lot of us make is that we want to diversify too early. By the time we get to the middle of the diversification process, we run out of time and finances. The next thing is that the project fails. But if we are patient to first create a stable, income generating blog and then add a new one later, things would work out perfectly fine. Thanks buddy. I am fine and my business is progressing by the grace of God. One blog that is well handled is good but it is more safer to have more than one so that in case of any eventuality, the other can sustain. However, I am still making effort to build my blog to make profit with it. Making money through my blog…well, I have been trying to do that (targeted traffic of course. I am still building my traffic). Although, I can’t say that things are moving according to my expectations. I had planned well, but didn’t implement everything (so, I expected the same reward out of lesser work, which was even worse). But, I am trying to change that up this summer. Do more this summer (this blog is certainly an inspiration for me, and for all bloggers out there, who are looking to make money through blogging). As for having more than one blog, I certainly wouldn’t recommend that. Managing one itself is hard, I don’t think I can do more than 1. Perhaps others can. Anyways, thank you for sharing this, Enstine 🙂 Appreciate it! I was busy reading your blog while you were busy commenting on mine. What a cross action ! You said it right, a man could be a blogging expert and still make no money out of his blog! That’s so very true! Because, to start making money from a blog, one must be willing to put conscious efforts in that direction. As you said, targeted traffic is the prime priority. If it is there, then the monetization aspect becomes much simple! Then comes the mode of monetization. One must select the good one based on the skill set one possesses. Regarding the one blog vs many blogs statement, I agree with you. It is very much possible to grow a single blog into something big and generate good revenue from it. In short, it is not always necessary to maintain multiple blogs to earn big. This is a different way of thinking according to the average joe that wants to get into blogging or are just starting out. This is true, blogging does not making you money. The monetization strategies does though such as adwords, banners, etc..
Also I do believe that there is not need to have multiple blogs in order earn 6 figures. You can accomplish this through one blog. The main thing is how you do this. Once you master this, then it’s up to you if you want to add more blogs. Just don’t be like an octopus on rollers, going in different direction and not going anywhere when you’re just getting started. Thanks for sharing Enstine and I hope you have a great rest of the week! Beautiful comment Sherman! I’m glad this post was useful. I love the statement “Just don’t be like an octopus on rollers, going in different direction and not going anywhere” That’s exactly what we become when we rush into creating blogs without a proper sense of direction. You know it’s cheap to create a blog these days so everyone things creating one is success. There is a not to it! Once again you have provided some excellent and extremely powerful food for thought! And given me some interesting spinoff “how to” content, that will take both video and blog entry form! Thank you! Obviously (as you point out) a newbie marketer/blogger would quickly become too overwhelmed trying to maintain fresh content on more than one blog! But like you touched on, a syndication of sorts certainly might work, provided every participant could really be counted on to consistently do their part. Probably better for the vast majority of us to (first) find a qualified mentor/coach such as yourself! And follow your advice as best you can and after you’ve managed to get some consistent real results! Then possibly consider branching out and maybe even add some back end consulting of your own! In any event, you can always be counted on to add a unique and extremely interesting angle/perspective! Thanks for sharing! Will definitely pass this excellent content along! My next post will surely draw the interest of everyone. I’ll be showing you how to grab a dofollow backling for a pr8 domain by simple action of drag and drop. Your blog post are always a master piece, i must confess that this particular question have been going on in my mind since i came into the world of blogging- though not quite long. Mine is a question, what if as i beginner , one start a blog in a niche he later discovered that he can’t really excel or is not profitable- is it wrong to reduce ones activities on the first blog while building another blog which he believe have more chances of excelling or should that person keep on with the first blog and try to figure things profitably. As for the question of one blog versus many, one authority blog where you can truly pour out your heart for your readers is far more better than two with lesser content- in case of Google hit, a good blog like https://www.enstinemuki.com, will always have great readers/followers because of what they stand to gain by visiting there regularly. if you consider what it takes to build an authority blog, you will know one is better. But like you have recommended in the comment section- grow your first blog to a profitable stage both to readers and yourself, then you can gradually expand to another. Now if you start a blog and somewhere along the line, you find out that something is wrong with the choice of your niche, stop wasting time and switch to where you are more productive. You can sell off the first blog to raise some money for the second. when you build a big list, you can always rely on for traffic when Google strikes. Of course like you mention, your communities members will always be around to checkout your content. There are many misconceptions about making money with a blog. It is important to make a distinction between the art of blogging and blogging for business. The art of blogging may not give the individual money if there is no monetization strategy. On the other hand, if “blogging for business” is the intention then a strategy to make money can be put in place. Hi Enstine, your suggestion about targeted traffic first makes a lot of sense in explaining the ability of a blog to make money! Well described about targeted traffic and other things, Can you let me know how to make a theme like yours? I see you were php developer so you may have knowledge in developing themes. I always used the free themes and my readers will run away by seeing the design. In these days targeted traffic is too worse, that does not leads to clicks or sales as I seen on one of my blog, therefore it may works some times or may not, but still my friend is saying get more visitors per day. The domain was co.uk and 80% from UK but only 20 visits per day currently as it is a travel blog, can you point me how to grow this blog into big? I think having one blog and working hard on it is the better option except one wants to create little niche sites. Hi Enstine, Good post. There are so many different options you can do with a blog to earn money. I believe it’s a matter of deciding the main goal of a blog and go from there; be it a training site, niche blog or authority blog. Anyone who says you cannot make money online, hasn’t given it their all and hard work. So excited to see you here on my blog and thanks for the engagement! First I want to recommend your post linked to this comment. It’s such a brilliant idea to help each other make money online. And now about this post, there is huge money to be made online. It’s all about goals and working to meet them. I must say yet another great post. well I’m doing great with my blogs and I’m earning quite good (which I’ve planned/expected). But I believe earning from a blog or website totally depends on traffic and as well as hard work and dedication towards it. A little experience would be a plus points in earning money in short time. Traffic is the keyword and of course, it has to be targeted. Good to hear you are doing well. A little more effort and you’ll be killing it! I have no doubt you are doing well in this Ryan. hi muki. you just hit the nail edge on my fore-head instead of my complete head. loi. this what am expecting. people think that having 5-7 blogs generates income of 5X7 BILLIONS. And also what i realised online about blog is that. it takes time. and also having 20+ targeted readers who are able to open their wallet on your blog is better that having 10000+ visitor who only came to saw your post tittle and then hit the exit browser tab. thanks for such motivational post. it stated clearly that whatever you do, you must reap. blogging on the best niche don’t guarante you the best $. rather blogging for some specific people breaks the yolks. I run many blogs now – though, I started off with one. Surprisingly, my niche sites return more returns from my authority blog! The act of blogging requires a curious eye for money that does not offend your readers! Achieving that balance is that joy or nightmare of bloggers! I realized and clearly understood that first deciding the content and constantly working towards monetizing and developing quality audience will pull the traffic in long run which will inturn help for earning good money. Thank you very much ! Hello, the first point in the post is what I had longed to see on your site. there are many good bloggers who write such articles so as to attract newbies but they miss the whole point which is tell people directly – they’re not going to make any money from blog. True – you can’t make money just by writing articles unless you’re writing paid articles. Making money from blog is a whole different concept and you gave a pretty well introduction to it. Yes, one can make money with just one blog but I cannot answer whether one can earn ‘enough’ money as it depends on individual’s needs. I was earning with just one blog in 2005, got carried away and started many blogs. Though all of them fetched me money, it was still not enough. I once published a blog post in which I explained how a single blog can get you a minimum o $116 per month. You are right Enstine. . One can boast of high targeted traffic and still walk away with nothing. There are too many reasons for that. The prime reason I would point out to is that particular individual’s spiritual capacity to attract money. I enjoyed reading your blog post Enstine Muki. Cheers. For a blogger, articles like this one, greatly help us. Indeed, I have not been getting a lot of money from my blog, but there is. I hope if I continue to struggle, then I will reap the rewards later. I gained motivation after reading this article. Your words really give me more strength. I will do my best! Great post Enstine, there is no limit how much you can make from your blog. Sky is the limit. Writing great articles is the key and that is very important to attract repeat readers. This is a very good topic to debate; I never believe that having more blogs is necessary for making more money on the internet. Maybe largely because I like focusing on one task before moving on to another. And like I’ll put it – always see that your first baby has grown and can walk on his own before your wife get pregnant again. If you can’t manage a blog and make decent money from it, then I don’t think you can manage multiple blogs and make a cent from it. Is all about knowing what you want from your blog from on set, finding the right market, knowing their problems, concerns, worries and complains; then, find and deliver to them the solutions to their growing problems. With a blog, you can achieve all these and make good income from it. I have followed down here from kingged.com, where this post was shared. You have raised a very good debate here. It think that its entirely dependent on your efforts that how much money you will make from your blog. Organic traffic converts the most. Hence, a good content building strategy mixed with SEO can do wonders for the income potential of your blog. I would also focus on building one blog rather than keeping my feet in several blogs. Thanks for sharing this with us Enstine. Really Sir blogging seems so easy but maintainence requires continuous and unending efforts and efforts lead to make money full of bagsssssssssssss……..
Ah yes, this is a big topic of conversation. I really hate it when people ask me how much money do I make with my blog! I don’t make any money with my blog but I use it as a marketing tool to connect with others which leads to my money making ventures. Right now I’m finishing up B-School with Marie Forleo plus I was just on a webinar this past week with Danny Iny and I’ve been on several with Jon Morrow. As I love to share on my blog, we’re not all here for the same reasons. What I have learned through this process myself and from these individuals is if adwords and affiliate sales is what you want your business to be then put them on your blog. You won’t make a full time living with them unless you literally have tons of targeted consistent traffic coming to your site. If you do then you can have advertisers on your blog and that will support you nicely. You NEVER want to take your readers away from your main goal. You should write content to get them to want to come back, be interested in opting into your list and then from there share with them what your services are. If you’re known for something in particular already then most people are eager to sign up for what you have. So the bottom line really is that your blog should be used as the tool to connect with your target audience so that you can get them interested in the product and/or service that you provide. Tada!!! Just had to add that in but you did lay all of this out very nicely and I hope that people will understand this more now. You know with direct advertising and affiliate banners, you can control the click target – opening the next pages in a new window. However, that’s not the case with Adsense. You have no control over it and every click takes the visitor completely away from your blog. That’s one of the reasons newbies should stay away from this model of making money. Most of us think we can make huge money by selling ad space or plastering affiliate banners here and there. It doesn’t work like that. Well, with huge traffic, these banners can generate real income but I think for most of us, we need a different strategy to earn big. That’s where using the blog as a tool plays a part and thanks for raising this point Adrienne. I’m sure sticking to your blog will bring good news. You are surely going to be sharing more of those beautiful things you learn with us. That’s very true. I agree that if you just create and publish content, you will not earn money because that activity itself cannot earn any cent. We should know the difference between blogging itself and blogging for business. When we say ‘blogging for business’, we should employ an effective strategy to earn money. However, you can also earn money with just one blog and that’s what this article is teaching you. I’ve learned a lot from reading this article. Thanks for sharing us this content, Arun! I’ve been making some pretty good headway with earnings. Making relationships with some of these “native advertising” networks can be pretty lucrative if you can build relationships from much larger groups. Well, gaining money is not the actual motive which works with blogging, I mean not always. Money is just a by-product from blogging, an acknowledgement. Your posts always clear my thoughts and give them a proper direction. I am glad that there are bloggers like you in the blogosphere. Let’s come to the point now! 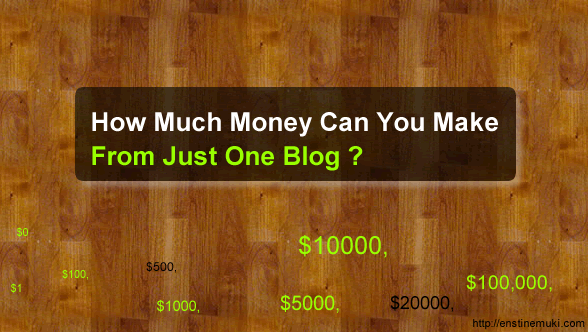 As you said, we can make thousands of dollars and even nothing as well with a blog. Money comes only with targeted traffic. But, if I want to make money online, I would start treating my blog as a business and business needs investment! What do you say on this? As I work alone, (just like One-Man-Army, being a bit funny! 🙂 ) I would prefer having a single blog as being a student I lack time because of studies! Your post also talks about the same! Thanks for posting. Have a great day ahead! Welcome to my blog Yashraj and thanks for the brilliant comment. Yes, treating your blog as a business is the way to go and every business needs investment. This is what many newbie bloggers have not understood. Thanks for the quick response! I would appreciate your way of building relationships with the commenters!! I will surely be waiting for your blogging as a student post! I have subscribed to your mailing list too! Moreover, I have decided to participate in $70 commenting contest of yours as well! Thanks for replying. Have a good day! I will stay tuned for the giveaway! Nice post and Yes, making money through blogging is not an easy task and require lots of hardwork, patience and consistency. Working on two or more blog is very complicated task and it also become very difficult to concentrate on one blog. So, working on one blog is good as by this we can easily focus on our blog and make money easily. Thanks for sharing this post.